The demand for more specialised business management training has been growing extensively over the last 5 years. Current economic pressures mean that businesses and organisations need to become more efficient and more effective in order to survive however this cannot be achieved without heavy investment in business skills and learning. Successful businesses are those that invest in their people. Those that don’t will fail. BMTG’s business management training compliments our flagship Project Management courses and cover specialised areas such as Strategic Procurement, Operational Excellence, Change Management and Business Improvement, Customer Service Excellence, Leadership Skills and Executive Personal Management many running to maximum capacity and many receiving critical acclaim from delegates. 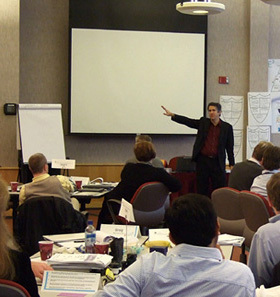 Each course is delivered in the unique BMTG style with a focus on real life experience and practical and beneficial interactive case studies. All of our Trainers are highly experienced practitioners who have operated successfully in the field and are with BMTG by reputation and invitation only. We have no ‘beginners’. All of our Trainers have themselves been trained in BMTG techniques and our style is common throughout our entire portfolio of courses.